The more I learn about Adobe Illustrator the more impressed I am at the phenomenal power that it has. Watching masters such as Deke McClelland and Justin Seeley make me realise that I have a very long way to go, but the journey is very exciting. I took a (actually several) photograph of an Eagle whilst in Juneau, Alaska and was having a look at it the other day, not a great photo, a little soft I thought but a nice photo none the less. Unfortunately the photo was taken in .JPEG format and not RAW so there is not a lot that could be done to salvage it although I did manage to extract a little detail to make it sharper. This was the end result. The background was very uninteresting to say the least and distracted from the photo so I replaced it with a black on grey background and included some brush strokes to add texture and move the focus to the eye and beak of the eagle. 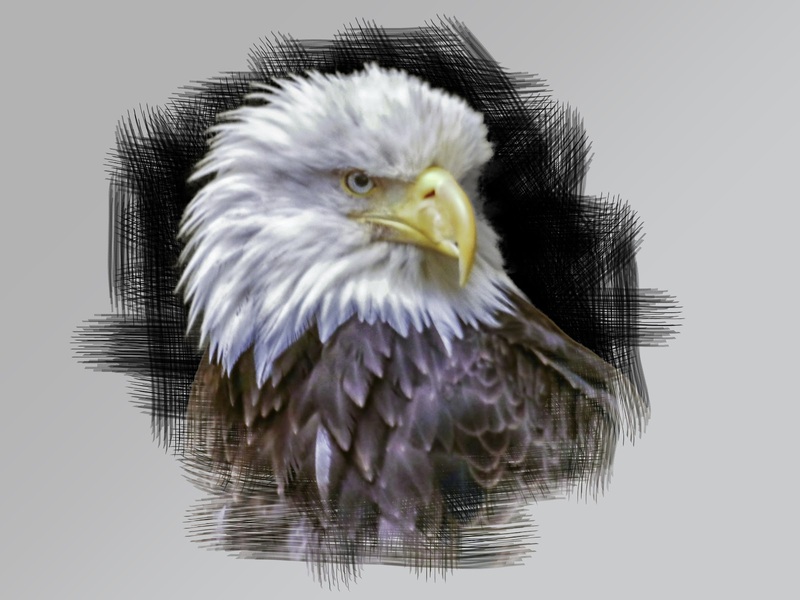 This was a by product of what I was actually attempting - the tracing of the eagle's head in Adobe Illustrator. Just have a look at this vector image which I have rasterised back into a JPEG file and tell me that this is not amazing. You would need to zoom in or enlarge the images considerably to see any difference. Amazing isn't it? No it's not perfect but it is sooooo close, I haven't counted but I would estimate that there are about 40 vector holes in total. There are almost a quarter million vectors prior to rasterising, it would take years to hand draw and colour this piece. My only regret is that I waited this long to start using Adobe's software.